A vision of sheer loveliness, this exquisite arrangement of pink roses and Queen Anne's lace is a bouquet that expresses sweet sentiments. Our florists combine one dozen 40 cm pink roses in a contemporary vase with luscious tufts of Queen Anne's lace to create a bouquet of soft contrast and color. More unique than a standard dozen roses, this bouquet is a favorite for birthdays, anniversaries, and romance. 12 Ballet Slipper Pink Roses (40 cm). Arrives in a stylish pink ceramic vase with fresh water, ready to be displayed. Measures approximately 12" x 15". Pink Dozen Roses and Lace is a hand delivered gift. These gifts are delivered by one of our local design centers located throughout the United States and Canada. Same day delivery is available for most gifts when ordered before the cutoff time. 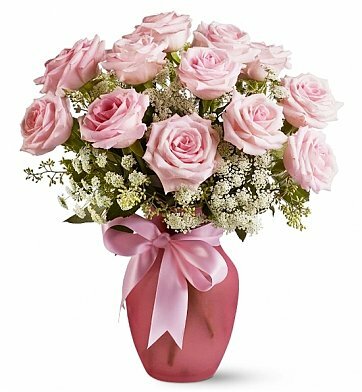 The cutoff time for Pink Dozen Roses and Lace is 10 AM in the recipient's time zone. wonderfully satisfying. words can not express the joy you bring people! Congradulations on new baby girl! We sent these to our daughter-in-law on the birth of our grand-daughter! She was very pleased with the arrangement and presentation. One depends so much on the integrity of the florist when you order over the internet, but in this case everything worked out just right. Thanks. I placed this order in the late morning, hoping it would make it to my daughter that day, and it did! Thanks for great service and beautiful flowers. Everything was great, looking beautiful! The pink roses were beautiful and my wife loved them! This was sent to an elderly lady for Mother's Day in the Pittsburgh, PA area and she is still thanking me. They took a picture and sent it to me and I have to say it was a beautiful arrangement that brought joy to everyone. Her daughter said it was the most beautiful arrangement of roses she ever saw and they lasted a long time so they could enjoy them longer than usual. I absolutely loved these being delivered same day they were ordered. They looked exactly like the picture when they got here and they are an excellent gift for a loved one!! Super deal for a great price! !